Lora Roberta Tipps was born October 1, 1911. She grew up on the neighboring farms of the Tipps and Casstevens families in Mansfield and the surrounding area. She attended Hardin Simmons University in Abilene, where she majored in Elementary Education. She then taught third grade for twelve years in Mansfield ISD. 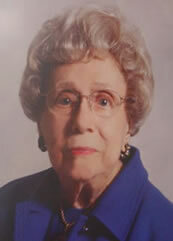 At the time of her retirement she had taught school in Texas for a total of 39 years. One of her fondest memories was taking a bus to Fort Worth on Saturdays to shop with her friends, Charlotte Anderson and Alice Ponder. Ms. Tipps was honored by the Mansfield ISD Alumni Association in 2000; given the Achievement Award by the Beta Phi Chapter of Delta Kappa Gamma Society; and was also honored by the Mansfield Chamber of Commerce in 1974. Ms. Tipps had a quick wit, and a true appreciation of the Mansfield community's history, and changes over the years. Mansfield ISD is proud to have dedicated this school in her honor.